The LEAD Sample External Store add-in is essentially a cloud-storage simulator. The add-in configuration allows you to specify a network or local location (as opposed to an actual cloud) where DICOM dataset data will be created/retrieved/updated/stored. The following table explains each of the configuration options. Note: when creating a customer external store add-in, you create a configuration class that defines the settings for the add-in. The user interface (above) is dynamically created from the configuration class that you define. The LEAD Sample shows the different kinds of user interface elements that can be created (i.e. text box, masked text box, drop, checkbox, NumericUpDown). However, the actual add-in only uses the Location textbox and Store Locally checkbox for configuration. All other configuration elements are not used, and are only to show the possible UI elements that can be used. 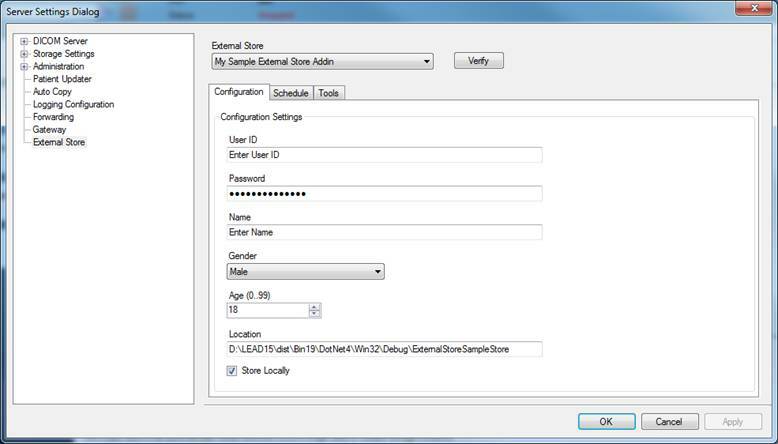 Configure the LEAD Sample External store add-in as follows, and click the Apply button.